Since I've decided to embrace my mum-tum in fitted tanks I've been enjoying wearing more of the tanks I have. Shopping my own wardrobe on my #6MonthsWithoutShopping challenge is still pretty enjoyable, I'm not bored yet . I love the simplicity of a tank, shorts and kimono outfit on a warm day. It's one of my go-to outfit formulas I wear over and over again. Even when I was pregnant. I've worn this green tank and floral kimono together before, although last time it was with a different bag and shorts. I really like the combination. While there isn't any green in the print of the kimono, I think they compliment each other nicely. 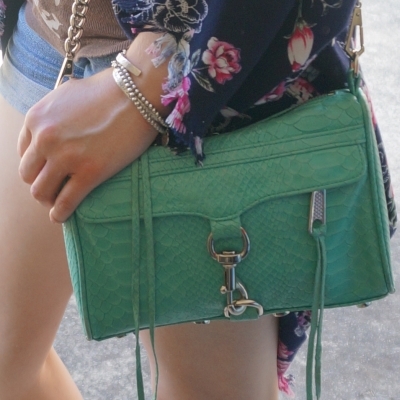 I like wearing this bag with green tanks too. Again, while the colours don't match I think they look nice together. A nice simple staple warm weather outfit for a day running a few errands, then spending time with my mum and sister in the afternoon after baby boy's weekly weigh. Last worn: Ray-Ban Wayfarer, Somedays Lovin' kimono, green tank, denim shorts, Rebecca Minkoff gladiator sandals, Rebecca Minkoff aquamarine mini MAC. Other ways to wear: Somedays Lovin' kimono and purple jeans, green tank and maxi skirt, denim shorts and burgundy tee, gladiator sandals worn 30 ways, Rebecca Minkoff aquamarine mini MAC and wrap dress. Unlike the outfit above where I'd worn similar things before, this was all new combinations. I was going through my box of tanks and wanted to wear this brown one that hasn't been worn in a while. I had also been wanting to wear this kimono again, and thought that they might work together, with the white floral graphic on the tank kinda matching the white based floral print on the kimono. As I said on instagram I'm still not entirely convinced it was a winning combination. I was happy I gave it go though, it doesn't look too bad and was something different to try! It was a quiet day. After a stressful night taking Baby Boy to hospital, my mother in law offered to take the boys to playgroup for a few hours. It was wonderful as it gave me a chance to catch up on housework and deal with eBay a little more. I'm trying to sell some of the boy's baby clothes on eBay but I forget how time consuming it can be! Last worn: Ray-Ban Wayfarer (above), floral cocoon kimono, floral print tank, denim shorts, Havaianas, aquamarine mini MAC crossbody bag (above). Other ways to wear: floral cocoon kimono and flares, floral print tank and striped skirt, denim shorts and ankle boots, aquamarine mini MAC crossbody bag and red jeans. You can wear floral kimonos with plain tops, but you don't have to stick to block colours and can also try a little bit of print mixing. Even if you don't love the result, no harm in giving it a try! You might find a new favourite combination. Linking up with What I Wore, Fashion Files, Fun Fashion, Fabulous Friday, Flashback Fashion, Weekend Wear. Those are lovely kimonos. Fab bag. Ebay is a time consuming hole! I have a few things I have been meaning to sell as well, but so far I haven't found time to even take pictures. It does take up so much time, for so little reward! Nice floral kimono! Very spring outfit! I can't wait to wear s similar combination once it's warmer here. I need to break out all the kimonos! "Embracing the mumtum" I love it. Congratulations on embracing the body you have rather than trying to cover it up :) That's actually inspiring. I'd like to get to that point myself eventually. I hope baby boy is feeling better and you're having a good week. Thanks, I'm sure you'll get there, you look great! :) I don't mind baring it all in a bikini but it takes some getting used to in a fitted top as it looks a bit like a baby bump I worry! Silly to worry! I love the aqua/teal colour of you bag, and this floral kimonos is really - it screams of summer and is absolutely putting my mind onto the warmer months ahead! I get nearly all my kimonos from Amazon. Such great finds there...and kimonos make for such effortless outfits! Love the colour of the bag! Its gorgeous and goes with the outfit perfectly! The mint green is such a pretty color! Thanks, I'm surprised I'm going to long with it too! Love the teal bag; that's my favourite shade of stuff to wear (my water bottle matches it and I have a coat that colour too!) I'm so envious of the weather you have that you can wear short shorts!!!! Love how the 2nd tank has pretty floral details. And good luck on the 6 months without shopping! This is so cute and Springy! I love the pops of green! You always have lovely kimonos! I can't wait until it's warm enough here to wear them. haha yes, taking the photos is so time-consuming! I love floral kimonos they are so versatile! I love shopping on eBay (my weakness) I need to sell more! I love the green bag! Such a cute look! loving both outfits, Mica! I'm glad you took the risk to combine those pieces in the second outfit, I think they look great! And I'm also glad you had some time for housework and eBay that day ;) All in all, you look adorable in these two looks, dear. Very cute look! Love the accessories and the outfit is so spring ready and chic! I'm getting ready to sell somethings on ebay and I am already dreading it haha. Both outfits are super cute, but really liking the bag! I love your summer go-to uniform! Your kimonos are so pretty! Both of these looks are so cute on you! 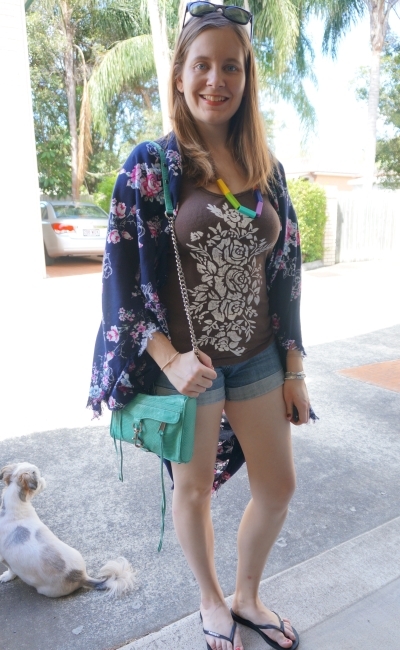 Cute kimonos and I love how you styled it! I have never sold anything on Ebay, I would love to one day. If you have the time and patience of a saint it's a good idea, haha!